MONOPOLY® Night is the major annual fund-raising event to benefit Charity Works, Inc. Join us for a fun-filled evening of dinner buffet, auctions, prizes, and a fast paced championship match with a real "jail" set-up on the premises for players to experience. Charity Works, Inc., an IRS §501(c)(3) non-profit organization founded in 1996, provides purchasing advisory services to numerous charities, schools and nonprofit entities, a wellness-medical aid packs program to benefit at risk children and economically disadvantaged individuals, and a job skills training program for displaced workers. Individual player levels: $275 Mr. / Mrs. Penny Bags Player with 10 chance tickets and 2 drink tickets; $200 Top Hat Player with 5 chance tickets and 1drink ticket; $175 Boardwalk Player; or $150 Park Place Player. See Sponsorship Agreement for special benefits. Non-player level: $100 seat in the Jailbird Lounge. Individuals and couples will be assigned to tables of four players. Capacity limited to 450 guests, including volunteers. The attire is evening casual. For more information call 727.447.2064, email Chris Renfrow at crenfrow@charityworks.org, or visit us at the office. 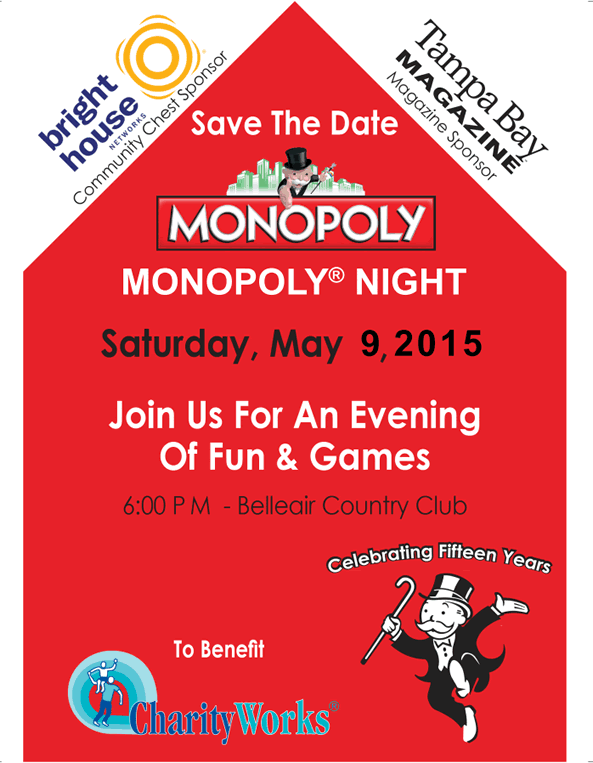 In an effort to support our programs and services, the 15th annual MONOPOLY® Night will be held at the Belleair Country Club on Saturday, May 9, 2015 at 6:00 PM. We invite you to participate as a sponsor and/or an in-kind contributor for this signature fundraising event. Since 1996, we have provided free purchasing and management advisory services to numerous local charities and schools. Our mission is to promote charitable giving and aid tax-exempt organizations by assisting them in managing their funds more effectively when those funds are used to acquire needed resources from others. For this year’s championship match, The Honorable George W. and Gail-Patricia Greer will serve as our Honorary Co-Chairs. We encourage you to be among this who’s who crowd where players compete in a 90 minute tournament at tables of four using the world’s most popular board game, MONOPOLY®. 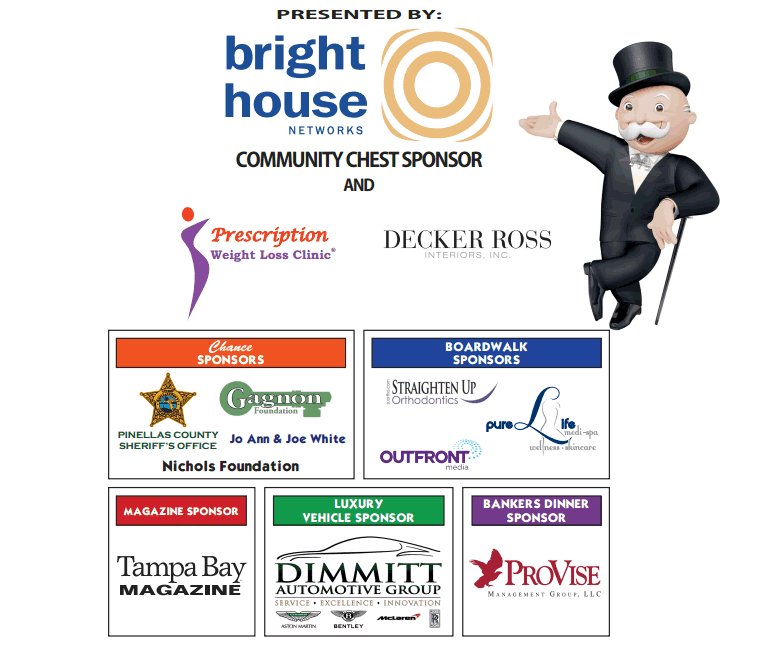 As a sponsor of MONOPOLY® Night, your company will be recognized in the local media, invitation and program. Each sponsorship level includes special benefits. Please see the Sponsorship Agreement, In-Kind Auction Prize Agreement and Fact Sheet for more details. Non-players are also welcome to attend, enjoy an extraordinary dinner buffet, witness the excitement of the games and participate in the live and silent auctions. We expect over 375 players for this fast paced tournament of rolling the dice, passing ‘GO’, drawing chances and accumulating properties. Enjoy being part of those game board enthusiasts who compete for top prizes and take a 1-in-4 chance of becoming a table winner. Many volunteers are needed for this event. See the Volunteer Banker documents for details. The net proceeds raised from this event will help to sustain our programs and benefit other charities and people in need. We are proud of our mission, Helping Those Who Help Others®. When it comes to leveraging charitable donations there is only one clear choice—Charity Works. Invite your friends, family, customers and employees to attend this exciting fundraiser. Seating is limited. Please reserve your seats today! For information about last years event, click here. Volunteers are needed to serve as Bankers during the 90 minute championship match. Over 350 guests will attend along with 100 volunteers at Belleair Country Club on Saturday, May 9, 2015. The time commitment to volunteer is a 1 hour training session that will be held on Wednesday, May 6th, at 6:00 PM and approximately 4 hours the night of the event. At MONOPOLY® Night, the duties of a Banker include assisting players with their game, answer questions about the rules of the tournament, monitor the table’s game play, help make sure the evening activities run smoothly, and assist players who bid during the live auction. It’s a lot of fun! Please see the Banker Documents section below for the registration form and other important information. The event program above requires Flash to view. If you cannot view any or all of the eight pages of the program or wish to download the event program in Adobe Acrobat (pdf) format click here. The MONOPOLY name and logo, the distinctive design of the game board, the four corner squares, the MR. MONOPOLY name and character, as well as each of the distinctive elements on the board and the playing pieces are trademarks of Hasbro, Inc. for its property’s trading game and game equipment, © 2015 Hasbro, Inc. All rights reserved. Used with permission.